Brunch served every Sunday from 10:30 am – 2:30 pm. All breakfast entrees are served with chips, salsa, and corn tortillas. Substitution fees apply to entrees. A traditional Mexican favorite, slow-roasted pork simmered in a delicious spicy soup, served with hominy. Garnished with the cool taste of radishes, cabbage, lime, cilantro, and chopped onions, on the side of course. Need More? The second bowl is on us! Everyone has to try our migas! Traditional scrambled eggs, lightly stirred with fresh peppers, onions and corn tortillas. Served with Spanish style potatoes, refried beans, and garnished with fresh slices of avocados and tomatoes. A soft-rolled cheese and onion enchilada, folded into an omelette, covered in chile con carne, or chile con queso, served with Spanish style potatoes, refried beans, and fresh fruit. 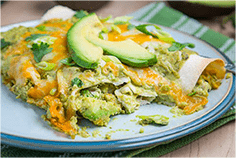 A traditional way of serving eggs over easy, right on top of a generous “stack” of enchiladas, layers of cheese, onions, and chile con carne, served with refried beans and Spanish style potatoes, topped with a fresh slice of avocado. A family favorite! Eggs lightly scrambled with chroizo, served with two beef tamales, Spanish style potatoes, refried beans, and pico de gallo. For the hearty appetite! An oversized flour tortilla, stuffed with scrambled eggs, beans, and potatoes, served with a cup of chili con queso for dipping! A cinnamon and sugar coated flour tortilla, lightly filled with warm peaches, topped with fresh peach juice and whipped cream! A perfect finish to a Vaquero breakfast! A nice blend of sweet champagne and fresh orange juice, try it with a splash of pomegranate in the glass! Our own spicy bloody mary blend shaken with ice cold vodka, how many glasses do you need? Delicious vanilla ice cream, flash fried and served over a generous drizzle of chocolate and caramel, topped with whipped cream. With chili con carne, one bean chalupa, and Spanish rice. A cup of our “homestyle” tortilla soup, served with an avocado half stuffed with our delicious chicken salad. With sour cream sauce, one tostada cup with chili con queso and Spanish rice. An old-fashioned favorite! Two tamales served on a bed of Spanish rice, smothered in chili con carne, topped with crispy tortilla strips, aged cheddar and Jack cheese, and chopped onion. With chili con queso, one crispy beef taco and Spanish rice. The chef’s favorite when he is too busy to sit down and eat! A big bowl of fresh taco meat (he calls it picadillo) served on a bed of Spanish rice, charro beans, topped with a spoon of chile con carne, jack and cheddar cheeses, and garnished with a hefty scoop of pico de gallo! A new favorite! Slow-smoked brisket, served in your choice of flour or corn tortillas (2) garnished with Feta cheese, cilantro, avocado wedges, and served with Spanish rice, charro beans and a side of pico de gallo. One chile relleno stuffed with jack and cheddar cheese, topped with our house ranchero sauce, served with a vegetable medley and slices of fresh avocado and tomato. With chili con queso, Spanish rice and refried beans. Marinated in lime and golden tequila, folded into flour or corn tortillas, topped with Feta cheese, sliced avocado and cilantro, served with a grilled squash medley, charro beans, and our house tomatillo sauce. A customer favorite! Delicious grilled tenderloin, served on a bed of field greens and hominy relish, topped with a fresh slice of avocado and drizzle of our “light” chipotle lime dressing. Tender chicken breast, served on a bed of field greens and hominy relish, topped with fresh cilantro and a drizzle of our “light” chipotle lime dressing. Superb beef, chicken & cheese nachos, potato skins, chicken flautas, and stuffed jalapenos. Served with guacamole and sour cream. Grilled squash, bell peppers, onions, and fresh mushrooms. Bean nachos topped with cheese & meat, your choice of beef or chicken. Served with a scoop of guacamole and sour cream. Vaquero Specialties served with Spanish rice and your choice of refried, charro or black beans. All dinners served with chips and salsa. Choice cut of ribeye (9 oz. average), char-broiled & blanketed with Monterrey Jack cheese & ranchera sauce. Served with guacamole, pico de gallo, and a cheese enchilada with chile con carne. Delicious breast of chicken marinated in a savory wine sauce with mushrooms, bell peppers, onions, and tomatoes. Served with guacamole and pico de gallo. Grilled strips of marinated tenderloin wrapped in hot flour tortillas. Garnished with chile con queso, guacamole, and pico de gallo. A grilled seasoned chicken breast topped with grilled tomato slices and melted Jack cheese. Garnished with guacamole and pico de gallo. Beef, chicken, or shrimp marinated in savory spices & grilled to perfection. Topped with sautéed onions, bell peppers, and fresh tomatoes. Served with guacamole and pico de gallo. Seasoned chicken rolled in corn tortillas, deep-fried, and topped with ranchera sauce. Served with guacamole and sour cream. A flour tortilla stuffed with beef or chicken, bell peppers, onions, and tomatoes. Fried crips and topped with chile con queso, complemented with sour cream and pico de gallo. Filet of fish, grilled and blanketed with our chef’s special sauce, a creamy blend of chile con queso, Jack cheese, and sliced avocado. Garnished with slices of onions and pico de gallo. Choice cuts of tenderloin, sautéed in a spicy ranchera sauce with bell peppers, onions & tomatoes, garnished with guacamole & pico de gallo. Two beef fajita enchiladas, rolled in soft flour tortillas, smothered with our house queso. Served with charro beans, rice, and topped with sliced avocados. Sliced tenderloin, marinated and grilled to perfection, garnished with slices of avocado, tomatoes, and grilled onions. Beef brisket stuffed into your choice of flour or corn tortillas, garnished with sliced avocado, Feta cheese, and fresh cilantro. Spanish rice and charro beans, and homemade pico de gallo. A house favorite! Two chiles poblanos stuffed with Monterrey Jack and Cheddar cheeses. Lightly battered, topped with ranchera sauce and served with guacamole & pico de gallo. One chile poblano stuffed with cheese, topped with ranchera sauce, accompanied with one of our famous sour cream chicken enchiladas, garnished with sliced avocado and corn medley, served with charro beans. A house favorite! Traditional Dinners served with Spanish rice and your choice of refried, charro or black beans. All dinners served with chips and salsa. Our house sampler! Begins with a toasted meat taco, guacamole, crispy-fried tortilla topped with chile con queso, one enchilada & one tamale topped with chile con carne. Vegetarian enchiladas grilled squash and red bell peppers, onions, mushrooms, and Monterrey Jack cheese, topped with a savory tomatillo sauce. Served with Spanish rice and salad. One crispy beef taco, one enchilada, and one beef tamale with chile con carne. Fresh avocado mixture rolled in soft corn tortillas covered with tangy tomatillo sauce, topped with Jack cheese. Served with a squash medley and black beans. Two enchiladas with chile con carne and one crispy beef taco. Three tamales smothered with chile con carne. Two cheese & onion enchiladas with chile con carne. Two over-sized flour tortillas filled with pulled chicken breast or picadillo (ground beef) and topped with chile con queso, garnished with lettuce and tomatoes. Two beef enchiladas with chile con carne. A chicken enchilada with sour cream sauce. A soft cheese taco with chile con queso (topped with lettuce, tomato, and cheese) and one crispy guacamole tostada. Two chicken enchiladas with a tangy sour cream sauce and jalapeño. One cheese enchilada with chile con carne, one chicken enchilada with sour cream, and one beef enchilada with chile con queso. Two cheese enchiladas smothered with ranchera sauce. One cheese enchilada, one beef enchilada, and one crispy beef taco with guacamole. Enchiladas topped with our chef’s lightly spiced chile gravy. Served “Homestyle” with lettuce and tomatoes on top. One crispy chicken taco and one chicken enchilada covered with sour cream sauce, garnished with jalapeño peppers. Shrimp Diablo enchiladas, grilled shrimp and mushrooms, folded into Monterrey Jack cheese, rolled and topped with our savory ranchera sauce, garnished with a slice of fresh avocado and tomatoes. Served with our house vegetable corn medley. Two beef or chicken tacos, crispy or soft, your choice. One sour cream chicken enchilada, one cheese enchilada with chile con carne, and one crispy beef taco. Served with Spanish rice. One cheese enchilada with chile con carne, one bean chalupa, and one crispy beef taco. Served with Spanish rice. Guacamole chalupa, bean chalupa, and chile con queso chalupa. Served with Spanish rice. One chicken flauta with ranchero sauce garnished with sour cream and guacamole. One cheese & onion enchilada. Served with Spanish rice. Order your favorite drink….or step south of the border and try one of ours! The kick is in the Cuervo. A delicious combination of frozen margarita and Sangria wine. Silver tequila, blended with hand-squeezed fresh lime juice, and agave nectar (approximately 134 calories). Check our Facebook Page for special drink offers and prices. Monday - Friday 4-7 PM - Half-priced house margaritas, draft beer specials, and other offers. Delicious Mexican pastry rolled in cinnamon & sugar. Served hot with butter & honey (6). Vanilla ice cream served with praline pieces, chocolate and real whipped cream. An old-fashioned favorite! Delicious Mexican pastry served with strawberries & whipped cream (6). Los Vaqueros is a participating restaurant of Blue Zones Project. Blue Zones Project is a community-led well-being improvement initiative designed to make healthy choices easier through permanent changes to our environment, policy and social networks. When our entire community participates, the small changes contribute to huge benefits for all of us. Los Vaqueros has implemented researched based best practices which optimize their environment so that healthy choices are easier to make for their customers. Two spinach enchiladas, stuffed with grilled fresh spinach and mushrooms, topped with a tangy citrus tomatillo salsa, served with vegetarian black beans and hominy corn relish. Two vegetarian enchiladas, stuffed with red bell peppers, mushrooms, onions, and a squash medley, served with vegetarian black beans and hominy corn relish. May we suggest you start your meal with a sparkling Topo Chico with fresh lime or your favorite fresh fruit juice? House-made of course! All produce is sourced locally whenever possible, delivered whole and sliced and diced fresh for use! Fresh peppers, onions, and corn tortillas with lightly scrambled egg, served with fresh fruit and Spanish style potatoes. An over easy egg, topped with a tangy citrus tomatillo salsa, served with Spanish style potatoes, vegetarian black beans, and fresh fruit. Looking for something lighter? Enjoy a fresh yogurt parfait, garnished with honey, toasted walnuts and seasonal fruit. Choices include: Enchiladas (Beef, Chicken, Cheese), Tacos (Chicken, Beef, Brisket, Rotisserie Tequila Chicken), Chicken Flautas, Quesadillas (Veggie, Beef, Cheese, Chicken), Tamales. All served with rice and refried beans. Breast of Chicken marinated in a savory Sangria Wine Sauce with Mushrooms, Bell Peppers, Onions, and Tomatoes. Served with Spanish Rice, a fresh Garden Salad and a Squash Medley. Flour Tortillas, Chicken and Beef Fajitas, Spanish Rice and Refried Beans. Chips and Salsa. Pick 2 of any fajita sides: Pico de Gallo, Grated Cheese, Sour Cream, or Guacamole. Get all 4 sides for $1.00 more per person. The meal starts with fresh guacamole, chile con queso, chips and salsa as an appetizer. Dinner buffet includes enchiladas with chile con carne, crispy beef tacos, tamales, Spanish rice and refried beans. Flour Tortillas, Chicken and Beef Fajitas, Spanish Rice, Refried Beans, and one Enchilada with Chile Con Carne. Includes Chips and Salsa. Pick 2 of any fajita sides: Pico de Gallo, Grated Cheese, Sour Cream, or Guacamole. Get all 4 sides for $1.00 more per person. *Chardonnay, Pinot Grigio, Rose, Merlot, and Cabernet Sauvignon. Have another favorite wine? We can provide it. Price will be assessed according to purchase choice. Custom menus, vegetarian items and dessert items available upon request. Prices subject to change by management at any time. Table service available for an additional charge. For event parking, please use valet only. Sales Tax, Beverage Price and 20% banquet gratuity are not included in above prices. Vaquero Chicken Salad served on 9-grain bread with french fries. Two fresh avocado halves stuffed with our “almost famous” Vaquero Chicken Salad. Served on a bed of rice. Two fresh avocado halves stuffed with our “almost famous” Vaquero Chicken Salad (contain pecans). A delicious traditional club, piled high on sourdough bread. Served with fresh fruit. Los Vaqueros is a participating restaurant of Blue Zones Project. Blue Zones Project is a well-being improvement initiative designed to make healthy choices easier through permanent changes to our environment, policy and social networks. Los Vaqueros has implemented researched-based practices which optimize their environment so that healthy choices are easier to make for their customers.